On Gaura Purnima, the birth of Sri Chaitanya Mahaprabhu, Vaishnava devotees fast the entire day until moon rise and then enjoy a fabulous feast that has first been offered, with love, to Sri Krishna Chaitanya. This is only a suggested menu and can be adjusted in any way you like. What is important, if you are choosing to cook a feast on this special day, is that you cook with love and offer with love. To make things a little easier for you on the day of Gaura Purnima, I strongly suggest that you make as many things as you can the day before. For example the paneer and the sweet rice could be made in advance. Slices of potato with herbs, butter, and sour cream, baked to a golden brown. Steamed spinach with fresh cheese/paneer. Simple, rich rice to compliment these tasty dishes. A good protein soup balances out other dishes high in sugar and butter. These small, puffy flatbreads are a festival feast favorite. This yoghurt and cucumber salad is a cool, crisp, creamy addition to a meal. A hot, buttery, sweet flavored with almonds, saffron, and cardamom. This is a delightful desert combining rice, milk, and sugar. Submitted by Anonymous on Wed, 03/07/2012 - 21:26. Careful - Srila Prabhupada said to fast from grains (like on Ekadasi) when breaking a fast on Visnu-tattva appearance days. That includes Gaura Purnima! Hare Krsna! 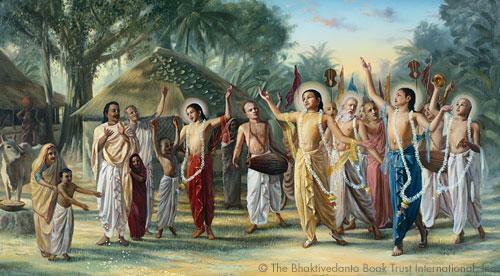 Happy Gaura Purnima to all! Submitted by Naresvara dasa (not verified) on Sat, 03/19/2011 - 03:52.